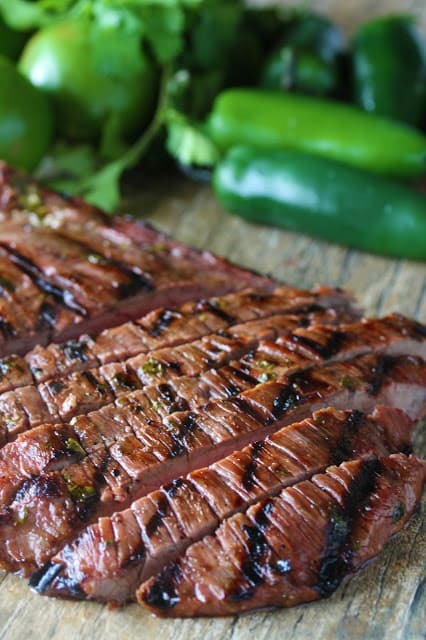 Marinated flank steak is grilled to perfection for the best Authentic Carne Asada recipe. This tender, grilled meat is full of authentic Mexican flavor. 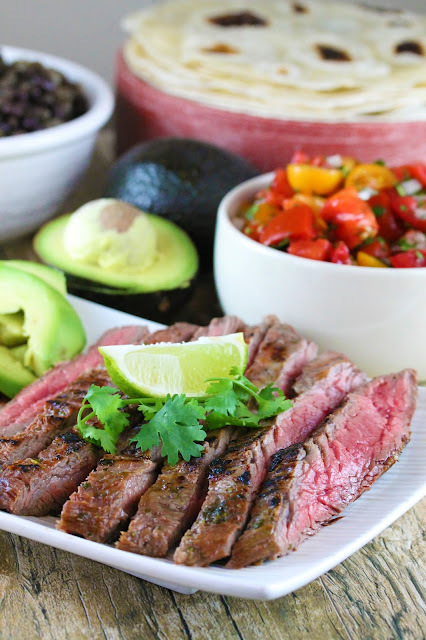 Marinated flank steak is grilled to perfection for the best Authentic Carne Asada recipe. This tender, grilled meat is full of authentic Mexican flavor. My recipe is based off of one from the world renowned chef of Mexican Cuisine, Rick Bayless. If you ever have the chance to go to his restaurant, Frontera Grill, in Chicago….GO! It’s unreal! Carne Asada is all about the marinade. Take a nice piece of steak, marinate it with some delicious flavors, and then plop that sucker on the grill for a flavorful piece of beef you can eat plain, on a taco, burrito, or anything else you can think of. It’s so good I often just eat it plain, like the fine steak it is. But I won’t say not to a carne asada taco. Yum! What kind of meat do you use for carne asada? Carne asada is traditionally made using skirt or flank steak. The two cuts are very similar, but I prefer the meatier one, which is flank steak. You can also use sirloin flap meat or thinly sliced brisket. PRO TIP: When cutting your meat, be sure to cut against the grain. It is quite easy to see the grain running through the meat in both of these cuts. It looks like lines. Do not cut parallel to these lines, always cut perpendicular to them. The grain provides a natural breaking point in the meat. If you cut against them then you end up with tons of breaking points in each piece which keeps it from being chewy. What should I serve with Carne Asada? Be sure to cut against the grain. The written recipe calls for marinating in a plastic bag. You can also marinate in a bowl. Just make sure the meat is covered. If you are one of the people in the world who don’t like cilantro, simply leave it out. Do not replace it with something like parsley. There are thousands of ways to prepare something authentically. This version of carne asada is cooked authentically on the grill and has an amazing amount of flavor. When using an outdoor gas grill, heat it to high heat, somewhere around 500 degrees before grilling this meat. Cooking time is an estimate and depends on the thickness of your meat. Use a meat thermometer for accuracy. If you like this recipe, be sure to check out my recipe for Authentic Mexican Beef Barbacoa. It’s absolutely divine! In a gallon size resealable bag, combine lime juice, crushed garlic, orange juice, cilantro, salt, pepper, olive oil, jalapeno, and vinegar. Squeeze it around to mix it up. Put the entire flank steak into the resealable bag. Seal it up tight. Make sure all the meat is exposed to the marinade, squishing the bag around to coat. Refrigerate for at least 2 hours, or overnight. 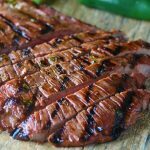 The best Carne Asada marinade recipe I’ve ever had. Delicious. Could I sub flat leaf parsley or something else for the cilantro? I have the gene that makes cilantro taste like Dawn dish soap. You can leave it out or sub parsley. We made this last weekend and it was amazing! We are makes it again this weekend when we are camping. It auto generates from a calculator. Can you also use chicken with this marinade? One of my family members does not eat beef…. I’m sure it would taste fabulous! My family and I have done chicken as well and it’s great! This recipe is by far one of the best I’ve ever made!